Newborn babies primarily breathe through their noses, which makes it all the more upsetting to a parent when infant congestion is a problem. Being unable to breathe is extremely uncomfortable for the tiny child, and frustrating for the parent. There are specific causes for the congestion; some of which are preventable. Congestion occurs when the membranes in the nasal passages swell or when mucus blocks the passages. These passage ways are not yet open; a means of ensuring that babies do not drown as they nurse. While this is a definite benefit for that purpose it is a disturbing in another, and that is when the infant is unable to breathe due to congestion. ● Irritants in the air. Dust can be a problem for the immature little respiratory system of an infant. Every home has dust, but minimizing the amount of dust in the rooms that the infant spends the most time in will be of immense help. Cigarette smoke is always strongly discouraged around babies, with the harmful ingredients a definite irritant to the delicate nasal membranes. Even the baby’s own milk can create aggravated conditions when spitting up forces the milk through the nose. Symptoms to watch for in an otherwise healthy baby that would indicate irritants are frequent sneezing, a clear and watery discharge and noisy breathing. ● Dry air. Even for adults, dry air can be a problem with the respiratory system. Imagine how much more so it would be for a still developing system, such as for a newborn. The dry air we encounter during winter months and the home is heated has an adverse effect on those delicate, sensitive nasal passages. The result is an unusually audible breathing pattern. While this type of problem is not technically congestion, it may seem so to parents. When the baby is well in all other aspects, and when there is no nasal discharge, dry air is usually the culprit. Forestall the problem ahead of time by keeping a vaporizer running through this season in order to ensure moisture in the air. 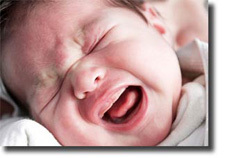 If the baby is already suffering from dry passages, using nose drops of saline solution will alleviate the condition. ● Infection. If an infant has been ailing with fever or cough and the discharge from the nose is green and thick, there is a good chance that the child has an infection. The infection could be due from a cold or may be the more serious influenza. A doctor should be consulted for a correct diagnosis. Plenty of fluids, medications recommended by the doctor and a slanted sleeping position keeping the head elevated will generally help the condition. ● Allergies. Babies are also susceptible to allergies, with possibilities of hay fever, pet dander, mites, dust or even its own milk as the offending element. For most allergens in the air, the infant congestion symptoms could include sneezing, runny nose with a clear, watery discharge present, wheezy breathing and coughing among others. Medical testing to determine the allergen is usually needed. Antihistamines will likely be required to alleviate the symptoms, but only a doctor prescribed medication is allowed. No over the counter preparations are suitable for such small babies. A parent can take some measures to ensure that the conditions that are likely to create a congestive condition in the baby do not occur. It is much easier to avoid an issue than to try and correct the problem after the fact. Air purifiers, vaporizers and continual protection from external irritants can keep your baby, and you, breathing easier.